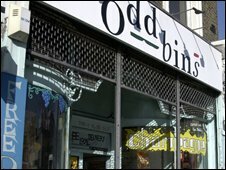 Off-licence chain Oddbins has been sold by its French owners to the son of a former owner of the business. Simon Baile has bought the business for an undisclosed amount from drinks group Castel Freres, its owner since 2002. Mr Baile is the son of Nick Baile, who owned the firm with colleague Dennis Ing in the 1970s. Fierce competition in the wine market from supermarkets and larger retailers such as Majestic Warehouse has made life tough for Oddbins. It is reported to have made a loss in 2006, the last year for which financial results have been published. But Mr Baile told the Daily Telegraph the firm had strong prospects. "This is a cash-positive business with plenty of stock, great locations throughout the UK and passionate staff," he said. Oddbins operates about 150 stores in the UK, including 20 in London. The firm was launched in 1963 when Ahmed Pochee began supplying wine to restaurants and clubs in the capital.